Exclusive 1305 A/B Villa La Estancia has redefined tropical luxury. Welcome to our custom furnished 2000+- sq. ft. villa. Rich ocean tones, leathers, and other fine fabrics will make you feel at home! Enjoy sleeping to the sounds of waves crashing and fountains running at the pool. Ocean, Mountain, & Pool views! Spectacular grounds include a 12,916 square foot gradual entry, heated free forms brim edge pool with a wet deck and special water features. This pool is great for all age children! This resorts offers an all inclusive meal plan for minimum 3 days and is a lovely option. We have the BBQ grill on our balcony. Feel right at home! There are 4 ocean front whirlpool hot tubs. Hacienda style private gated entry, in rustic antiqued metal, takes you inside the lush villa equipped in travertine and the finest materials. Marble showers, Maple cabinetry, acid washed & granite countertops. This is a great vacation experience! Bring the laptop and keep in touch at the pool, on the lanai, or in the room! Our home by the sea, is your dream vacation destination in Mexico! This is the only villa with a comfortable queen Murphy Bed located in the Great Room! There is an on site English speaking doctor! Swim up pool bar. Real Estate professional and mother of three! I was tired of showing up at a 5* hotel and not loving what I paid for. I loved the space 2300+- square feet and the concept of a villa with hotel services. My children play at the beach or pool all day and I see them from my balcony or chaise pool chair. The gym and spa are state of the art! The concierge will do your grocery shopping. The baby sitting services are fabulous too! The chef's will cook for you in your room or grill a steak at the restaurant for you. Fabulous restaurants on the property and within 5 minutes. The pool is great for all ages and the bar rocks! I love that we can relax in our villa and hit the city too! A few of our favorite restaurants close by are: Sandrina's, Mark's, Franscati's, Faijita Republic, Mezzagiorno, La Casona, Pie In The Sky, Carnes Del Mundo (American butcher), and Karen's. We have a grill so we can relax in too! I made my famous potatoes and the head chef Laurent delivered the fresh ingredients to my room from his kitchen. You feel at home if you are visiting 2+weeks this is so inviting. You have a view of mountains the Punta Mita mountains and beach. 3rd floor with views of ocean and mountains! You can also hear the fountains at the pool. We love sleeping with the doors open and listening to the waves. The hotel provides linens, I own a set, so they just get washed with the hotels. There is a clothes washer & dryer and a sink for hand-washing! There is a delicate & hand-wash cycle available. I keep detergent stocked in the unit. I own a set a towels, so they just get washed with the hotels or you can wash them yourselves. All state of the art workout facility and Spa included. You can use a laptop by the pool or in the villa! House keeping does not do dishes! This machine scrubs it all clean. I keep dish washer soap stocked in the unit. Serves fresh drinking water, crushed ice, and ice! No need to buy bottled water! Coffee filters are in the cabinet under the coffee maker. Old coffee to, you might want to bring your favorite. All dishes and utensils like you would have at home. Coffee Maker with timer, toaster oven, and blender for delicious milkshakes!! WiFi TVs, so you can bring your Apple TV and view what they broadcast in Mexico. The pool is mulit-levels with waterfalls, fountains, rocks, and wet tanning area. You can have chairs in the water! There are lots of umbrellas if you need shade too! Great set up for a family with teenage kids! Very clean and super location to everything! The property and unit are very nice. Absolutely amazing resort and staff..We will definitely return someday, hopefully soon!! This property is great for families, girls weekends, romantic get away or for just sometime away.. Very well maintained and clean, owner very responsive. Owner was very responsive and easy to deal with. The unit was very clean and is a well laid out villa. 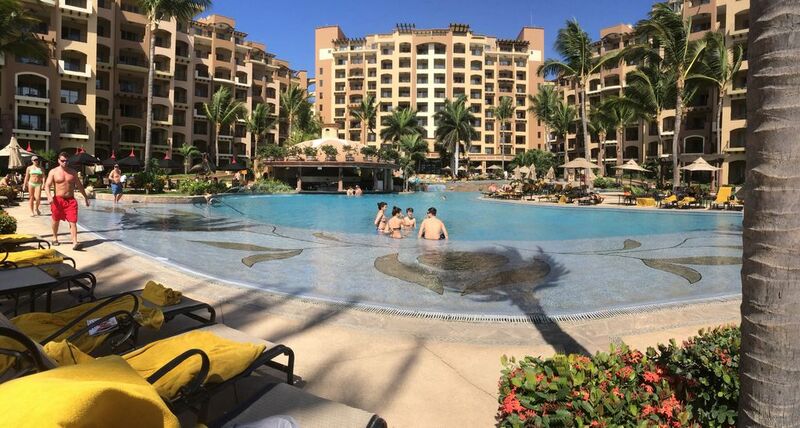 We love the location both within the resort and that iit is close to the fabulous restaurants in Bucerias. We will be certain to tell our friends and plan on renting this again next year. Amazing staff and service. We had an amazing time during our stay would definitely recommend villa estancia to all my friends!! Trampoline in water, kayaking, themed beach party evening and Mexican Fiesta buffets with entertainment, Yoga, Pilates, and personal training available, The Best Spa in Vallarta and on-site grocery, coffee, and internet cafe. There are over 5 on site restaurants and over 30+ great restaurants close by!! Sandrina's, Mark's, Mezzgiorno, Karen's Place, La Laguna, & Portobello's are a few of our favorite places! The horseback riding on the beach is awesome too! You can run for miles on a flat lovely beach.